There are some facinating stories of people who lived in the early days at St. John's Wood. Please select from the list of people for whom interviews have been conducted and transcribed by our Historical group and discover what life was like in the "Olden Days". 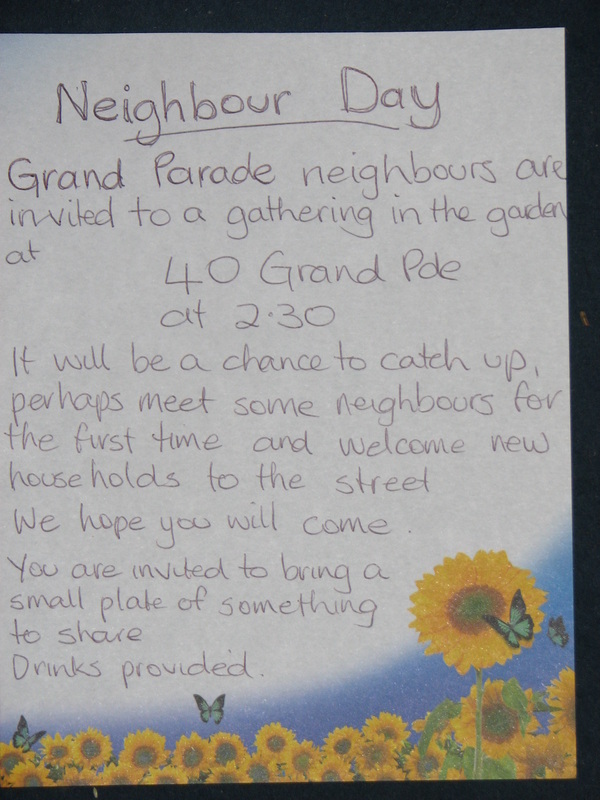 Do you know someone that has lived in St. John's Wood and has a story to share? Perhaps a family member or neighbour could conduct an interview and send it in for publishing. 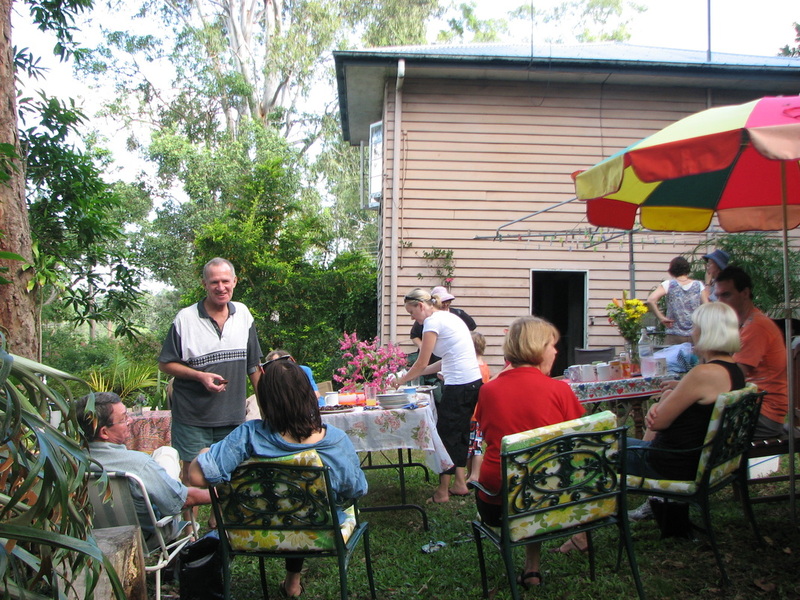 When the suburb was young, neighbours were cherished and life long friendships flourished in many streets. The example I can best describe is Grand Parade, the top section on the flat. That's where I was born and where I still live, up in the tree tops with a panoramic view across to the city. There were just four homes on the top side of the street and four on the low side. The big house on the corner of Buckingham and Grand, number 40, was built by the Glynns, Andrew and Brenda in the 1940s. It was 48 perches. They loved trees and left as many as they could. Peter was their first born in 1937, then came Gerald who played classic piano from his childhood, then came Brende, my playmate. Andy and Brenda never moved. They lived out their lives here. They loved the place. When Peter was a boy in the 50s, Mum received from him a gift for Christmas of a canned fruit string tin painted red with a transfer on it for decoration. She used it all her life. Next door were the Bayleys. Brian and Dorothy began building their home in 1936 and extended it with the help of a war services loan when Dad returned from the war. 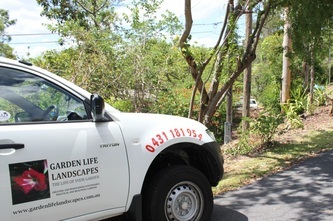 He loved landscaping and put in all the terraces going right up the steep hill to the back. When they moved here, they already had Graham and Vilma. Diane was born in 1937, Michelle in 1945 (sadly she died at birth), and Sandra in 1949. Next along were the Kings in number 48, the big square white house on another 48 perch block.. Bert and Doris (or Uncle Bert and Aunty Doris as we called them) had rwo daughters, Dierdre and Beverley. He was a handy man. Mum used to say Bert could not only fix anything but he had the where-with-all to do so. After my father died in 1954, Uncle Bert was always there with a solution to any problems that came up around the house. The end house, number 52 Grand Pde, was built and lived in by Mum's brother Harold Hodges and his wife Signe (nee Larsen) Signe's brother Jum lived down in Gresham Street. 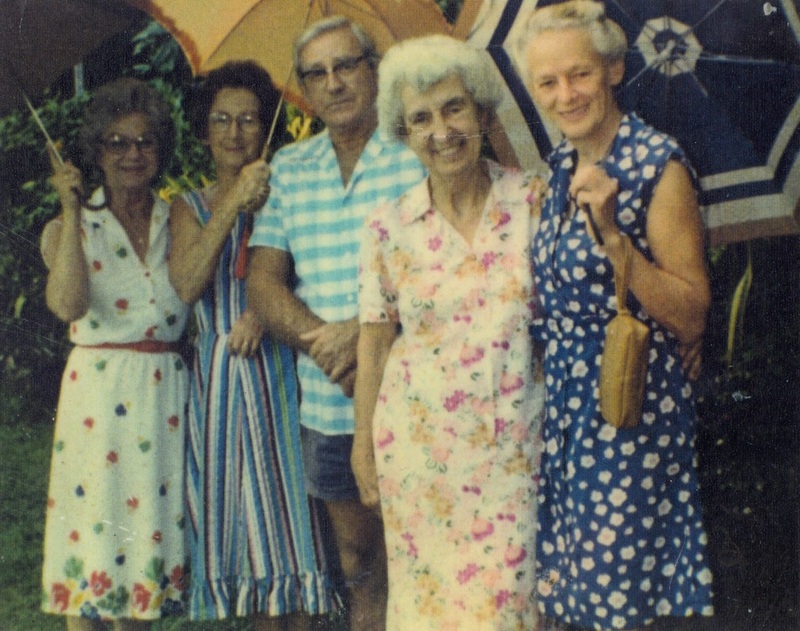 The Hodges children were Geoffrey, Kaye, Margot, Peter and David. My older sisters spent a lot of their time as children over at No 52 playing with their cousins. By the time I came along, the Hodges had moved on to the next house Uncle Harold was building down in St Johns Avenue. He built at least eight houses in the Woods. 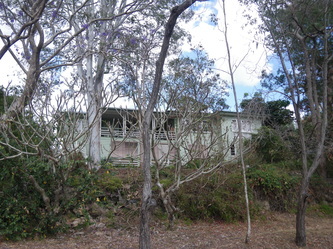 The Dalys moved in to number 52 for a time before Max and Thelma Griffiths moved in with their children Ian and Rhonda. They stayed for the rest of their lives. They set up the Rock Shop in the city. After Mr Griffiths died, Uncle Bert took on the role of Thelma's helper also. 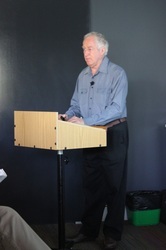 He used to call Mum and Mrs Griffiths his "widdies", his affectionate term for widows. There was a well worn track between the four houses with little gates in all our side fences. If the Bayleys wanted to visit the Griffiths, we would call out to the Kings on the way through to alert them to our passage. Conversely if the Kings wanted to visit the Glynns they would call as they passed through our place and so it went. 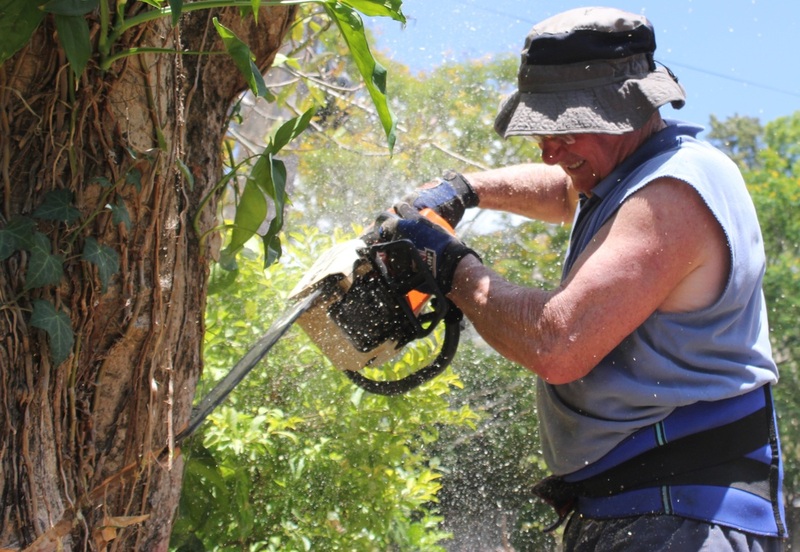 It wasn't often that we went into one another's house but all sorts of converations were had and help offered across the fence or in our gardens and under our houses amongst the tools. We all swapped plants, ideas, opinions, produce, a cup of sugar here or an egg there, lifts in the car by those who had one. The Kings always had chooks. The whole width of their back yard at the top was one huge chook pen. I don't recall we ever bought eggs from a shop. 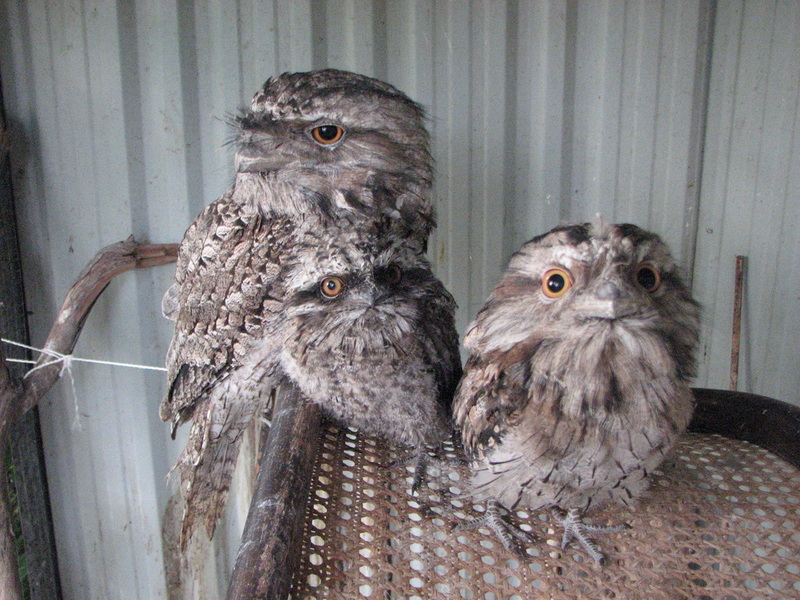 When they went on their annual holiday to Coffs Harbour, it was my job to gather the eggs. I loved it. Glynns had chooks, ducks and for a while, turkeys. I learnt a lot from Mrs Glynn about care of birds and respect for nature and many aspects of life. The neighbours were almost like an extended family. When, much later in life when I had returned to Grand Parade, Mrs Glynn invited me to call her Brenda. I just couldn't. It didn't seem right. We hailed from an era when older people were called Mr and Mrs or Aunty or Uncle. The house across the road from 52 was built by Uncle Harold Hodges for his brother, my Uncle Edgar Hodges and his wife Beth. 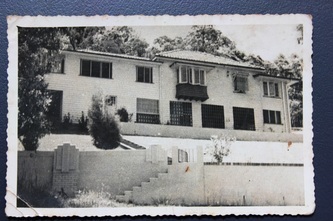 They moved out in 1952 and Mrs Leyland and her daughter Jan Temperly bought the house. They lived there happily for many years. Ray and Estelle Benton and their daughter lived there next. Ray was an artist and taught some of the locals about art. 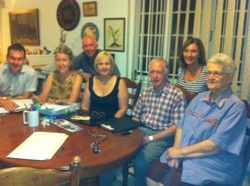 Next to them and opposite the Kings lived Jack and Leila Bennett and their son Wayne. Jack was a taxi driver. 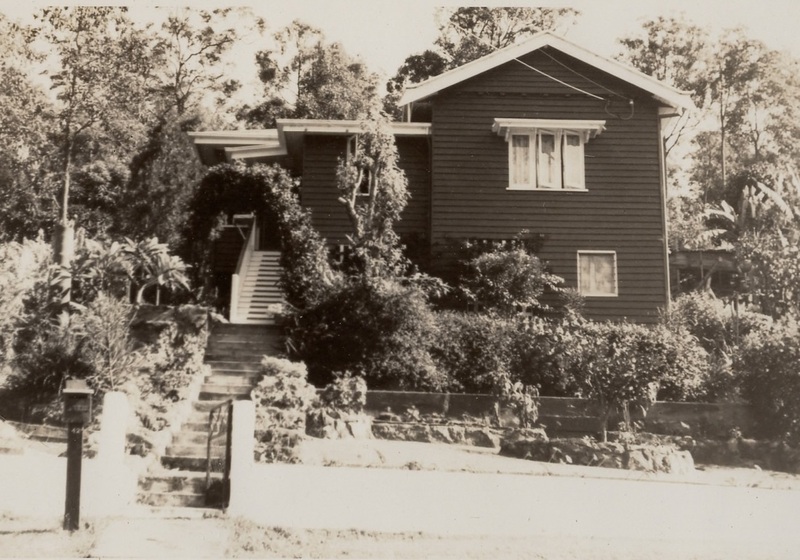 When they moved out Leith and Madeleine Angelo bought the home and converted it into a picture landscape of gardens and ornaments and beauty. They were both artists. The Hannigan family owned the next house along opposite the Bayleys. 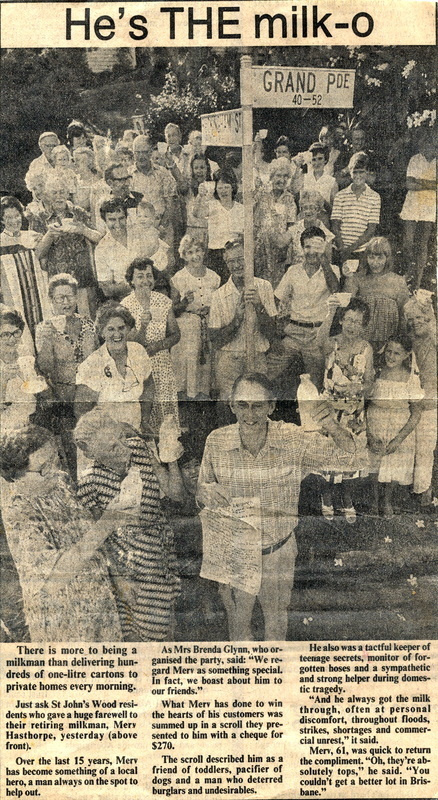 Bryan and Mavis raised their seven children in number 37. Mum always recalled that after Dad died prematurely in 1954, Bryan Hannigan said if she ever needed any help with jobs around the house, just to call him. 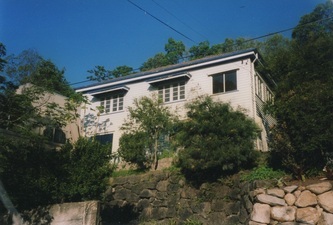 The end house, opposite the Glynns, was built by Bill Byrnes as home for his wife Joyce and their three children. 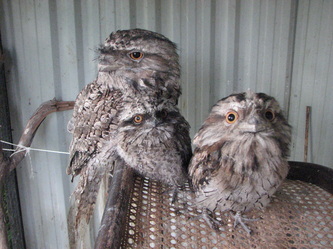 A lot of Tawny Frogmouths find their way to St. John's Wood. 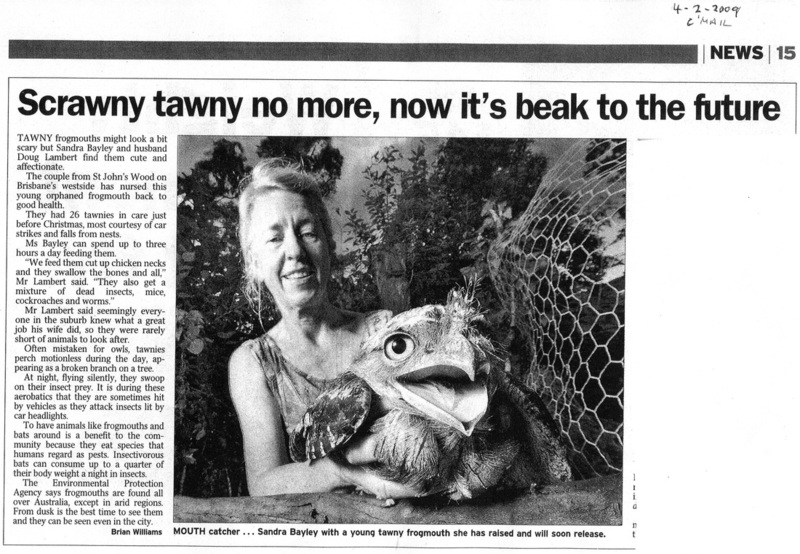 Sandra Bayley, (nicknamed "The Steve Irwin of St. John's Wood") takes in orphaned and injured 'Tawnies'. Each year about 25-30 orphans are handed in during the breeding season, spanning September to November, and are released when fully grown and able to hunt in February. 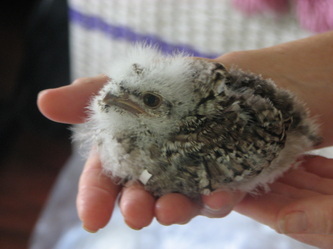 That's if she is unable to re-unite the nestlings with their parents, which is the ideal outcome, There is always an opportunity to help raise them. 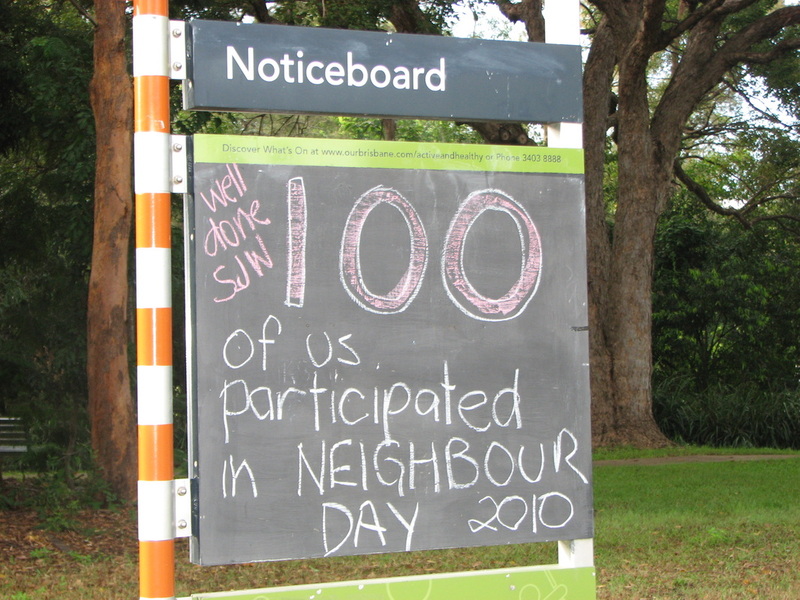 A sign on the community noticeboard lets neighbours know when help is required. 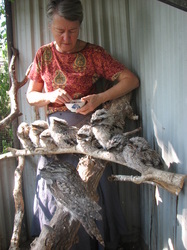 She releases some of them locally and is always keen to know how they fare. Again, the blackboard comes in handy. 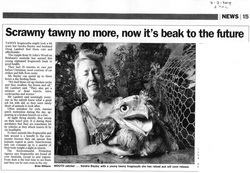 She invites anyone who has seen a Tawny behaving in a too-friendly manner, or in difficulties, to let her know. They are more vulnerable than birds raised by their natural parents. 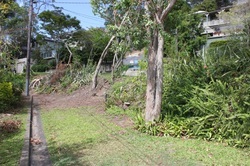 A section of the nature strip was damaged by Energex when a powerpole was replaced, so the local community embarked on a rehabilitation project. 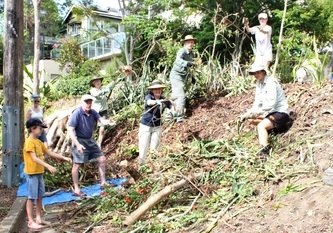 Clearing weeds and undergrowth, laying jute matting and replanting natives and edibles were the main steps for the project. 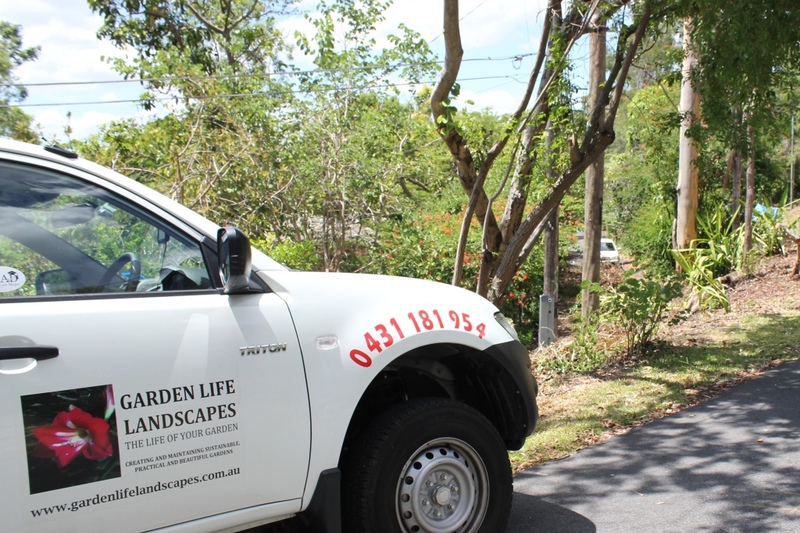 Special thanks to "Garden Life Landscapes" for volunteering their professional advice and services to ensure that the project reaches its full potential. 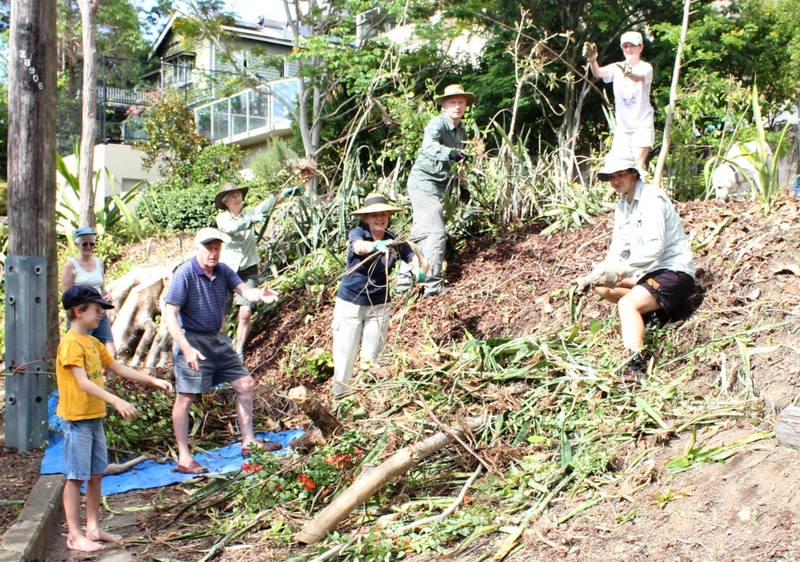 Councillor Geraldine Knapp also kindly offered the supply of the Jute matting and logistical support for the removal of the green waste. 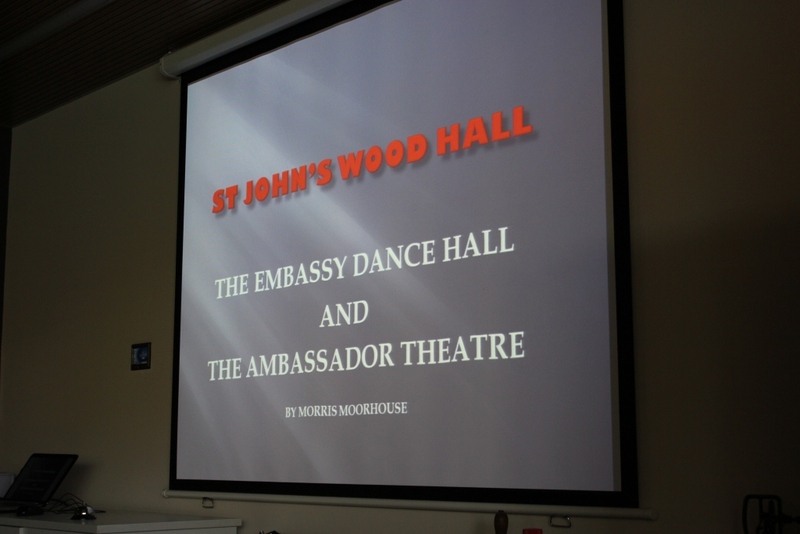 There is a dedicated group of locals who are committed to exploring, researching and reporting significant aspects of the history of St. John's Wood. 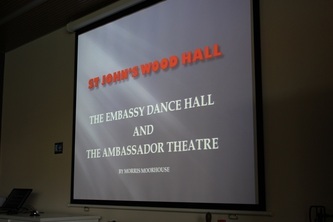 They are keen to interview long-term residents and build an accurate portrayal of the historical story of St. John's Wood. 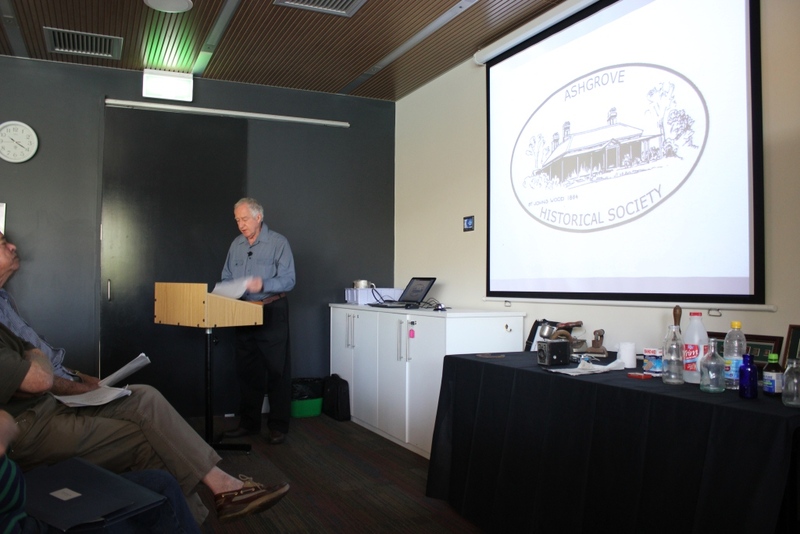 Some of the information gathered has been presented to the Ashgrove Historical Society. (See below: Morris Moorhouse presenting the history of St. John's Wood Hall) Anyone interested in attending their bi-monthly casual meeting is welcome. The group requires old photographs, images, maps, stories etc. Sandra Bayley spoke about her Mother, Dorothy, who lived and raised her family in St John’s Wood. 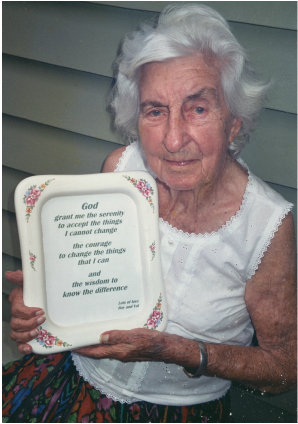 She lived there for 70 years and was actively engaged in community affairs until she died at the age of 100.